One of my friends was very talented. Talented, not in terms of work and performance but in terms of clearing interview. He was a mediocre professional with an average rating in performance. But he used to clear all interviews. When I asked him his success mantra, then he said: “Magic is not in knowledge but in the expression of knowledge.” It all depends on how you represent yourself. “Most of the time interviewer doesn’t know you personally so in that case you can exaggerate your achievements.” He said. An interview is meant for skill assessment. A candidate’s knowledge and skills are being checked with a certain set of questions and their answers. If a candidate is belonging to different industry or area, when the interviewer is not knowing him/her personally then it is really tough to assess them. In such cases, Interview and Background verification are the only things to evaluate. Background verification is more about Candidate’s past career record and less about the performance record. Referral Checks are also used to verify the candidates, but most of the reference turns positive. Considering this, the interview becomes a most important parameter for evaluating the employability of candidate. Type A: Candidates have an excellent record and they know how to explain it. Type B: Candidates have an excellent record but don’t know how to express. Type C: Candidates have a poor or average record and don’t know how to handle. Candidate of type “A” is really good to hire. They are usually mature and responsible. Candidate of type “B” can be hired only if the interviewer know them personally or they are carrying some real references. Type “C” is a clear “No” case. No consideration for Type “C” candidate as they become job-beggar and are causing headache to HR. Emotional calls should be avoided anyway. Now our discussion point is type “D”. They fake their achievement most. The skill of expression is so good that it is really near to impossible to check them during the interview. I am not doubting the skill of Interviewer but there is some limitation in judging a personality in few minutes. As I said earlier too if a candidate is not known to you and if you cannot find your own referral points, then you are more dependent on the questions and answers. How are they able to fake? Such candidates aren’t common to find but are usually a job stealer, so interviewers have good reason to worry about. They do research properly about the company and job requirements. This gives them a fair idea that which kind of question may be asked. They also modify their facts and figures which will fit the requirement. They know that if fitment will appear 100% correct then it will raise doubts. So they intentionally miss few points to appear natural. They are very strong in quick responses and reasoning. Their response appears so natural that you are forced to believe the facts presented. The common and so-called tough questions are easily available on the internet and that cannot create a trap for such candidates. One interesting part of this kind of candidate is that they really have good technical knowledge. Please note, skill and knowledge are two different things. The persons who can convert their knowledge to skill, are really an asset to an organization but they are rare to find. 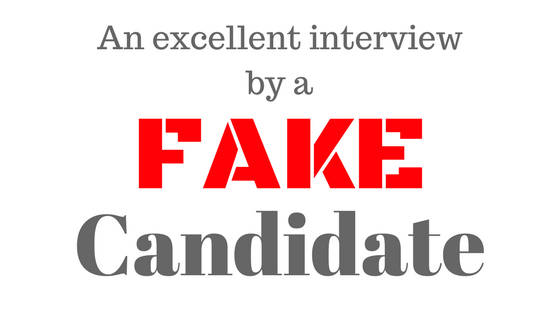 Type D candidates can explain their knowledge well and will make you believe in them. How to identify and catch such candidates? Candidates of type A and type D are really tough to differentiate. If you ask a regular set of questions then both will be selected. You need to have some surprise set of questions. The questions should be able to make the candidate think before answering. This surprise question will be totally industry dependent and case by case basis. For an example: “If you chose to be an entrepreneur then how will you use your technical skills?” An honest answer to this will talk about the productivity of their skill but a fake candidate will talk strategic thing. Recommendation: Don’t pick your questions from the internet, they research better than you. It is also observed that such candidates leave a job for non-performance. Asking more questions on the reason for leaving their current organization will make them uncomfortable. Fake candidates lose confidence at this point more easily. Over the period, the process of interviews has changed and Interviewer has become even smarter. They started using new methods and tact. Faking the achievements is not an easy task now.